We are unique as animals because of our upright posture. The vertical position of the spine is reflected in the increase in size of the vertebra from superior to inferior. The vertebral column is divided into five major regions. There are 7 cervical vertebrae that occur in the neck while the 12 thoracic vertebrae have ribs attached to them. The 5 lumbar vertebrae are found in the lower back and the sacrum consists of 5 fused sacral vertebrae. The coccyx is the terminal portion of the vertebral column consisting of 4 coccygeal vertebrae. 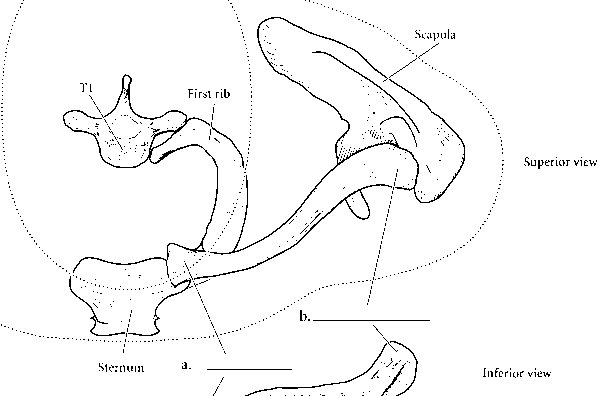 The vertebral column in the adult has curves. The uppermost is the cervical curvature and the lower ones are the thoracic, lumbar, and pelvic curvatures. Label the illustration with the regions and the curvatures and color in the regions with different colors. Color in the curved arrows for the curvatures. 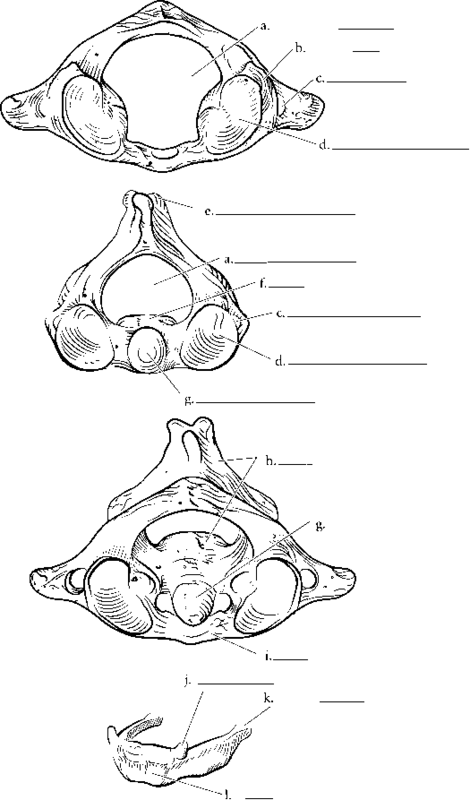 The atlas is the first cervical vertebra. It is unique among the vertebrae because it has no body. Label the vertebral foramen, superior articular facet, the transverse foramen, and the lateral masses. The axis is the second cervical vertebra and it has a body with a projection that arises from the body known as the odontoid process or dens. Label the axis including the superior articular facets, the transverse foramen, the spinous process, and the vertebral foramen. Color these features in. Here are the atlas and axis together. Color the two bones separate colors. The hyoid bone is a floating bone, which means that it has no hard attachments to other bones. The main part of the hyoid is the body and the two horns that arise from the hyoid are the greater cornua and the lesser cornua. Label these parts of the bone and color them in separate colors. What is the first CERVICAL CURVATURE?